Wonderful Tybee Island Vacation Rental! Great Location, Close to Restaurants, Shops, and Beach! Looking for smaller Tybee Island vacation rentals? Southern Belle has you covered with our great selection of rentals both big and small. Our vacation homes Tybee Island have fantastic locations that can put you right on the beach, or further inland if you want to be away from the crowds. Staying in vacation rentals Tybee Island GA is a great way to be just outside the city of Savannah while also giving you the chance to play in the sun and sand. Beach and Racquet is one of our smaller Tybee Island vacation rentals at only 490 square feet with one bedroom and one bathroom. This gives it the feel of an average size apartment. However, despite its size, it can sleep up to four guests, which makes it a nice vacation homes Tybee Island option for families with small children, a couple or individual stay. 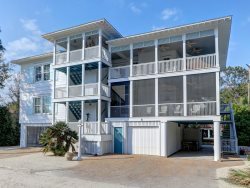 The location on Bay Street makes this one of the vacation rentals Tybee Island GA on the northwest side of the island. This is one of the quieter spots on the island and puts you in close proximity to the historic military installations from the Civil War, as well as the always-popular Tybee Lighthouse and Museum. Some of the perks of this property include being only 100 yards from the beach, a lovely ocean view, a large pool, lots of parking, free Wi-Fi, a balcony with plenty of seating and a queen size bed along with two rack beds. Walk into this cozy, refreshing property and enjoy the open concept of the living room and kitchen. The balcony is right outside of the living room and offers a beautiful ocean view. The beach and island decorative touches are throughout the apartment, including nautical art and blue and green color themes. You'll find the one bedroom down the hall and it includes two rack beds, perfect for children. The outside balcony has plenty of seating and a table. It's not always easy to find Tybee Island vacation rentals with pools, but this one offers a large pool on the premises with lots of seating and even in view of the ocean. There's also a tennis court on the premises and a long boardwalk leads down to the beach. You can't beat the privacy and proximity of vacation homes Tybee Island like Beach and Racquet by Southern Belle. Even though Tybee Island is a small place, at less than three square miles, there's still plenty to do near all our vacation rentals Tybee Island GA. The location of this property is near the north tip of the island and slightly to the west. Attractions right nearby include Gerald's Pig and Shrimp restaurant, the Savannah Beach Racquet Club, Battery Habersham, the Tybee Lighthouse and Highway 80, which will take you to the rest of the island and out to Savannah if you wish. The west side of the island mostly has fresh water beaches, but the east side has two main Atlantic-facing beaches in the Mid Beach and South Beach. The latter beach is typically the most crowded and also features a number of restaurants nearby with ocean views. The other attraction here is the Tybee Marine Science Center, which is fun for kids and for anyone who wants to know more about the island's ecology. Other fun options on Tybee include renting watercraft such as jet skis, kayaks and surf or paddle boards. Alternatively, you can take a charter out to watch dolphins, fish or just cruise around. When you stay in vacation rentals Tybee Island GA, you'll also only be about 20 to 30 minutes away from downtown Savannah. Many visitors choose to stay in Tybee Island vacation rentals while planning to make Savannah their main event. Even if you plan to spend most of your time on Tybee, a day trip to Savannah can add some fun variety to your itinerary. One of the best ways to see a lot of downtown Savannah in a short time is to take the Old Town Trolley Tour. You can even get on and off at one of its many stops. Other top spots in Savannah include Forsyth Park, River Street, the City Market, Colonial Park Cemetery and the historic Mercer House. If you're in the city in the evening, you can't miss one of the fantastic ghost tours, covering all the top haunts in Savannah. Another option for fun near vacation homes Tybee Island is to see if there are any events going on during your stay. Southern Belle can provide you with a current schedule, but you can generally expect events near all major holidays, including St. Patrick's Day, the Fourth of July, Christmas and more. Tybee has its own well-known festivals like Pirate Fest in October and the Tybee Island Beach Bum Parade in May. Make Southern Belle your choice for Tybee Island vacation rentals the next time you visit Savannah or the surrounding areas. You won't find a better selection of vacation homes Tybee Island with the amount of amenities we provide. Staying in vacation rentals Tybee Island GA vs a hotel gives you incomparable privacy and flexibility. It also gives you the chance to explore and experience the area more like a local. Give us a call today to find your new favorite place to stay. Quick to respond to all questions, thorough at check-in, her enthusiasm made us feel welcome. Cute condo on Tybees north end. Quiet area. The condo had all the things needed. It has a mini fridge instead of large fridge that worked out fine for us. Plenty of towels were provided Overall it was a nice property and we will definitely plan another stay. Loved it and would return. I did a late check in so i picked up keys from drop box, the next morning a member of your staff called to check to see if we found the property satisfactory. the property had access to a pool and the beach, the common areas were well kept. it was a pleasant experience. This condo is beautifully decorated, comfortable, and situated in a perfect spot. I loved the ocean view and watching ships go by. The complex is calm and quiet- perfect for relaxation.